Kindergarten kids are literal. I haven’t taught Kindergarten but I can speak Kindergartenese. I can count by two’s…2, 2, 2, 2, 2. I know what a “reptangle” is. I know that every spring Kindergartner kiddos “dive” Easter Eggs. Welcome to school Kindergartners! You will love it here! Riverview has joined with Macey’s and Fresh Market to help schools give back to our community. Macey’s and Fresh Market are supporting local schools through the School Cents program. In order to join the program from Macey’s, please follow these easy steps. 3. Press the "select" button next to the school or charity you would like to link to your account. Once your account is linked, you can view which school your account is linked to by logging into your Macey's Perks account at http://maceys.com/perks and selecting the "Nonprofits" tab or ask a team member at our customer service booth. You can do join the Fresh Market school cents program by follow these easy steps. STUDENTS MAY SIGN UP FOR MORE THAN ONE CLUB. The students will receive a T-shirt (one per year), healthy snacks, physical exercise, a prevention healthy lifestyle lesson, and 1 hour of club instruction each week. The Boys/Girls Club has an early morning homework club that is available each day from 8:00-8:30. It is available for students who need to arrive early and students who would like extra educational and homework help. Kelsey Mortensen will be the morning club instructor. The club will be in room #32. This club is free, we will need a registration form fill out for it. We know that one communication channel doesn’t always meet all parent needs. When we think about our parent audience, individuals range from “tell me only what I need to know” to “tell me everything”. There are a number of communication channels to keep you connected. This will be sent to your email each week. Make sure your email is updated in AspireSIS. Mrs. Mathis, Mrs. Jensen and Mrs. Killian update the website regularly. Keep informed about Riverview Elementary events through the school website http://riverview.nebo.edu/. Most days Mrs. Killian and/or Mrs. Nielson share learning both our teachers and students are involved in. It is a great way to become connected to real time happenings within the school. September 7th – Sixth grade orchestra recruiting assembly; 9:15 a.m.
September 29th – Make Your Mark Assembly @ 9:00 a.m.
We kicked off our first week of school with Riverview Elementary School’s annual Flag Ceremony. 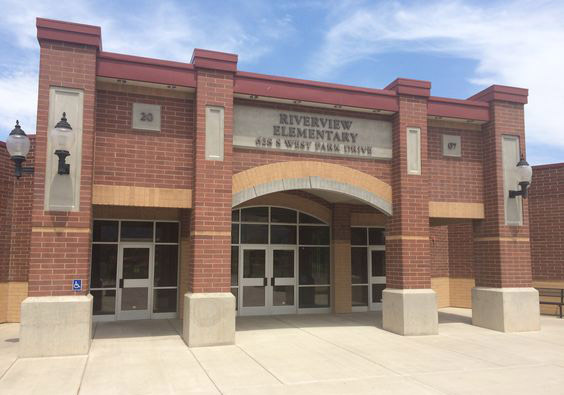 Welcome to the Riverview PTA Blog! Are you interested in chairing or co-chairing a PTA committee? The PTA is seeking a committee chair for the following positions: Fundraiser Chairperson, Reflections Contest Chairperson, and Red/Green Ribbon Safety Week Chairperson. Please take a look, talk to friends who may want to volunteer with you, and let us know where you might like to contribute your talents and time. Questions? Email: riverviewpta@gmail.com. Welcome Back! We hope you all had a fine vacation and are looking forward with enthusiasm to the new school year. A new school year presents opportunities for various beginnings...new classes, new faces, and new teachers. We cordially invite you to attend Riverview Elementary's Open House on Monday, August 21st from 3:00-4:00 p.m.
Come rub your hand across your clean desk, show off your back-to-school haircut, and meet your teacher and classmates.